Chess players Magnus Carlsen (left) of Norway, the reigning world chess champion, and Sergey Karjakin, of Russia, contemplate their moves during round 1 of the World Chess Championship in New York, New York, Nov. 11, 2016. 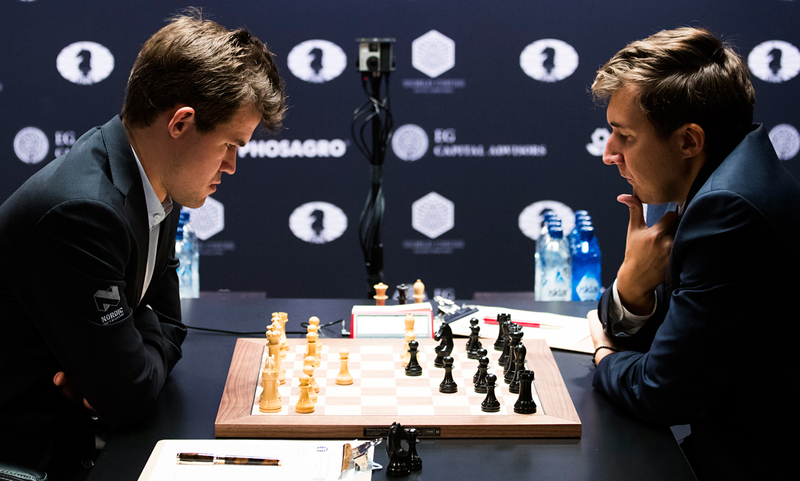 Reigning World Champion Magnus Carlsen of Norway and his Russian challenger Sergey Karjakin finished their 12th game of the World Chess Championship Match in New York on Nov. 28 with a draw. Their overall score after 12 games played is tied at 6-6 and both Grandmasters will be playing a series of tie-break games on Nov. 30 to determine the new world champion. "Upcoming developments during the tie-breaker have nothing to do with the game of chess," Russian Grandmaster Anatoly Karpov, the 12th World Champion told TASS on Nov. 29. "It is wrong to determine the new world champion this way." "Rapid games are more or less suitable, but blitz and the possibly ensuing Armageddon (game) are stupid," Karpov said. "Such a system can only choose a neighborhood champ, but never the world champion. This is a monstrous invention, which totally goes against all common sense." "At the very least, the tie-breaker should have been either made up of six rapid games or played until the very first victory. In this case, it would look more like the game of chess," he added. In line with the official FIDE (World Chess Federation) regulations, the tie-break stage begins with four rapid games, which are played with 25 minutes granted for each player per game and 10 seconds added after each move. Can Russia regain its place at the top of world chess? Should the score still be tied after the series of rapid games, Karjakin and Carlsen will play two blitz games and if the winner is still undecided they will have another set of two blitz games and may continue to the maximum of five such sets of blitz games. The last and deciding stage of the tie-breakers is the Armageddon game, in which a player with White has five minutes and must win the game to become the World Champion, while the one playing Black has four minutes, but needs only to draw to win the champion’s title. In any case, the 2016 World Champion will be decided on Nov. 30, when Carlsen will also be celebrating his 26th birthday.